Trouble Getting Approved in Alabama? Summary of Alabama Usury Law(s) / Quote: "Legal: 6% Contract: 1% above discount rate or Greater of 8% or 2% above prime Judgment: 12% Corporate: Any rate agreed to above $2000"
Code 5-18-15 (Alabama Lending Laws) "Quote: (a) Maximum rates of interest and charge. Every licensee under this chapter may contract for and receive as interest on any loan of money less than one thousand dollars ($1,000) an amount at a rate not exceeding three percent a month on that part of the unpaid principal balance not in excess of two hundred dollars ($200), and two percent a month on that part of the unpaid principal balance in excess of two hundred dollars ($200) but less than one thousand dollars ($1,000)"
Quote: "(b) Account maintenance fee. In addition to the maximum rate of interest and charges pursuant to subsection (a), a licensee may enter into a contract of loan under this chapter in which the borrower agrees to pay an account maintenance fee of not more than three dollars ($3) for each month of the scheduled period of repayment of the loan provided that the scheduled monthly payments are equal to or greater than thirty dollars ($30). Such account maintenance fee shall be determined at the date of the loan, but may not be prepaid. Such fee as so determined shall not bear interest and shall constitute a part of the finance charge"
Kristina lives in Montgomery AL and was struggling with debt. She had four credit cards with all their balances maxed out. On top of that her husband had a gambling addiction that put their household finances into the danger zone. He used to work for the City of Birmingham in waste management but was unemployed. Their monthly income was drastically reduced because of this and Kristina was emotionally drained because of the stress due to their collective debt. Her credit score was FICO rating was 680 at the time so her ability to get a loan with somewhat hampered. She tried getting approved with a credit union in Montgomery but she was declined. Then she tried her own bank branch at Wells Fargo and she was declined there as well. The loan officer at Wells Fargo told her that her credit score was being affected every time she applied with each financial institution. This really upset her because she didn't realize that. Luckily she had only applied with the credit union and WF. She decided she was going to try the Internet to find a loan, and as you know that's when things get a little bit wild and crazy. She came across many offers online but those were almost all predatory lenders in the quick small loan category. She needed to get approved for at least $60,000 and she needed to get approved fast. In her case she did the smart thing cleaned up their financial act as best she could before applying anywhere else. This is a GREAT idea. Before apply (online or with a bricks and mortar bank) you should pay off as many high interest debts as possible. She went even further and reduced their monthly bills (utilities, cell phone, landline, cable, etc.) as much as possible. That made a big difference but she was really tired from all the overtime she was putting in at work. Once she had all that looked after she continued searching online for lenders that weren't predatory in nature. She was trying to find a reasonable APR with flexible terms for $50,000 - $60,000. She was now aware of the implications from applying with lender after lender so she took her time to find a way to apply that would not damage her FICO even more. She finally came across our website and was happy to see she apply with hundreds of lenders without damaging her score. She chose to use our Fast Loan Pre-App option AFTER reading about all of the laws for consumer lending in Alabama. Within four business days she was approved for a loan. She got emails from three lenders in Alabama that approve loans for people with fair credit scores. She accepted the terms and conditions set forth by the lender that gave her the best rate (of course), and had the money in her account at the five day point since her pre-app was submitted. She was extremely relieved to get the loan and paid off all her credit cards, her husbands cards, and their overdue bills. She kept a close watch on her budget to make sure they were making ends meet and that they were making their monthly payments to her new lender. Her husband entered into a gambling addictions program and they're much better off today. If you live in the State of Alabama and you're struggling with a bad credit rating we hope our website helps you in some way. 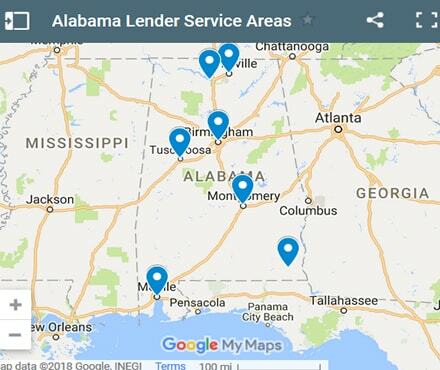 Last 5 debt service loans approved in the State of Alabama. Source: WFL Lender Pool. Updated Weekly. Principals rounded to the nearest $1000. Relative interest rates listed below in order left to right. Note to Alabama debt service providers: contact us for listing removal. On this page you can browse all of the debt service providers above if you need to consolidate your debt. You must be a resident of Alabama to receive consolidation, relief, or counseling. You can also fill out the application form above for consolidation if your credit rating is bad. We also have a city index below with links to each Alabama city or town. On those pages you can review all of the debt service providers in your local area. We also have some information on the usury laws in Alabama. It's good to brush up on this information before entering into any kind of loan agreement. This is an example of a consolidation loan approved for a resident from Birmingham who borrowed $20000 to pay off court fines, back taxes, and credit cards. Marcus had 6 different credit cards at the time his pre-app submission for a loan. He owed close to $12000 on his cards and he was missing payments on all of them. He had recently been overspending and it really caught up with him this last year and a half. He also owed around $2000 dollars to the Alabama court legislature for motor vehicle fines (speeding tickets), and he owned $6000 in back taxes. He was ordered by the IRS to pay back the $6000 within the month or they would start charging interest every month. You don't want to mess with the IRS because they'll put you in the poor house if you don't keep your eye on the ball and remit your taxes accurately every year. The reality for Marus is that all of these debts could have been avoided if he had any solid knowledge on how to deal with his money. How to set a budget, track incoming money and outgoing money. None of these debts were due to bad luck, and now that he's learned his lesson he likely won't won't be going down this road again. The most important thing about a consolidation loan is that you don't start spending money on non-essential "stuff" a soon as you pay off your high interest debt. It's so easy to fall into that trap. You see that all your high interest debt is gone, the collection agents aren't calling anymore, and you feel like you have room to breath again. It's a fairly common thing to see a borrower turn around and start spending more than ever before the ink has to time to dry on the lender's loan agreement form. Anyway, long story short. Marcus used the WFL lender pool to his advantage and got approved for his $20K with in a week and he had three different lenders email him with a day of applying. He chose the best deal possible from a lender based out of Montgomery. He was approved by a lender from Birmingham as well but the interest rate was two points higher than the one from the Montgomery lender. 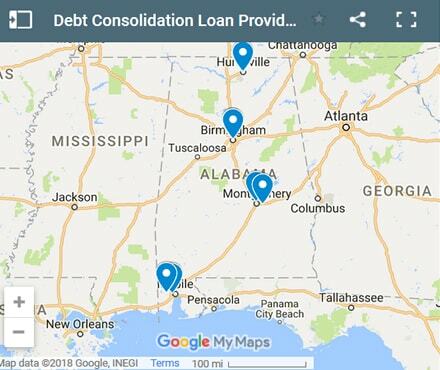 If you live in the State of Alabama and you're trying to get approved for a debt consolidation loan, we hope our website helps you find a good lender and a low interest rate. If you live in the State of Alabama, and you're struggling with financial problems we encourage you to seek professional help.